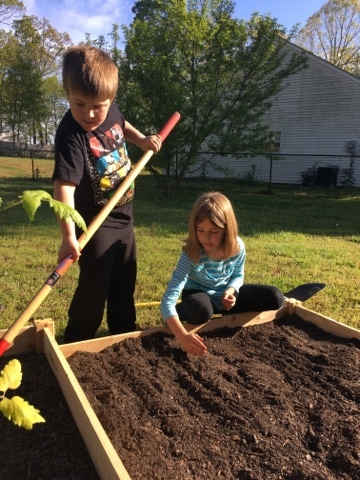 Our family had fun planting our little vegetable garden this week. And after helping me choose which lettuce seed packet to open, my daughter actually asked for salad for dinner that night! 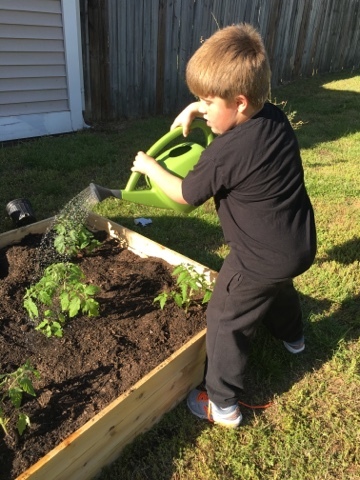 Vegetable gardening with kids teaches so many healthy habits. Kids are more likely to eat the vegetables they grow themselves. At three years old, my daughter refused to eat baby carrots from a bag. Once she pulled one from the ground, however, I couldn't have stopped her from eating it. Like many 7-year-old boys, my son is somewhat addicted to Minecraft. Tending our garden gets him outside and moving. "Not all bugs are bad!" is a constant refrain. We talk about pollinators and their importantance. We talk about why I hesitate to use pesticides in our garden. In our culture of instant gratification, I think watching a plant grow from seed is good for the soul. My daughter asked after the garden this weekend, concerned she'd miss the seeds sprouting while she was away at her dad's house. We will celebrate the first sprouts, the first flower, the first tiny green tomato. What a beautiful way to live life.